Hundreds of people in the U.S. and Canada witnessed a space rock about the size of a minivan enter the Earth’s atmosphere and streak across the sky as a giant fireball early Tuesday morning. At 12:50 a.m. ET a likely meteorite — a meteor that made it all the way to the Earth’s surface — lit up the night sky with a spectacular flash of light. 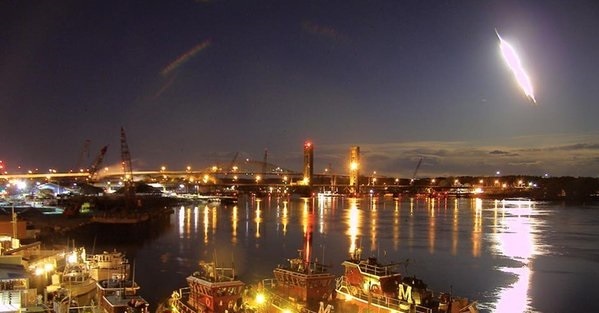 The American Meteor Society (AMS) had received nearly 700 reports of the event primarily from Maine, but also from Vermont, New Hampshire, New Jersey, Massachusetts, New York, Rhode Island, Pennsylvania, Connecticut, Ontario and Quebec. Based on witness reports and video footage, Tuesday morning’s fireball was definitely a big one, said Mike Hankey, an operations manager at AMS. That’s much larger than the majority of the thousands of meteors raining down on Earth every year. But smaller than the 16-meter-wide Chelyabinsk meteor that crashed into a lake after streaking across the skies over Russia in February 2012. The meteor likely entered the Earth's atmosphere over eastern New Hampshire and traveled northeast, ending its fall in northwestern Maine, southeast of Sherbrooke, Que., AMS estimates. We are currently in the midst of a meteor shower, the Eta Aquarids. However, it is unclear as to whether or not the fireball was associated with it. The Maine Mineral & Gem Museum is offering a $20,000 US reward if someone recovers a piece of the meteorite weighing at least a kilogram, the Associated Press reports. About 100 tons of dust and sand-sized particles known as meteorites enter the Earth's atmosphere each day, though most are too small to be noticed, according to NASA. The agency estimates that a meteor about the size of a car enters the Earth's atmosphere on average once a year, producing an impressive fireball that burns up before reaching the ground.